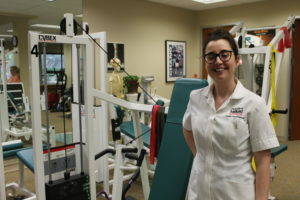 iotherapy major at the University of Salford in Manchester, UK, completed a month-long externship at the South Texas sports medicine specialty clinic in May. Arnold has now completed her final elective, and expects to graduate with her second degree this summer (she already has a bachelor’s in sports rehabilitation). She said her time at the Non-Surgical Center of Texas has been eye-opening. NSCT Director of Physical Therapy Julie Barnett said she has long wanted to train a student from another country. The clinic has trained countless students from UT Health San Antonio and other schools, but never one from abroad. Arnold is looking forward to using what she has learned in her first job. She has been offered a job in a rotating post at a hospital in England with the National Health Service.